Osamu Suzuki's term as head of the carmaker has been extended a further year. 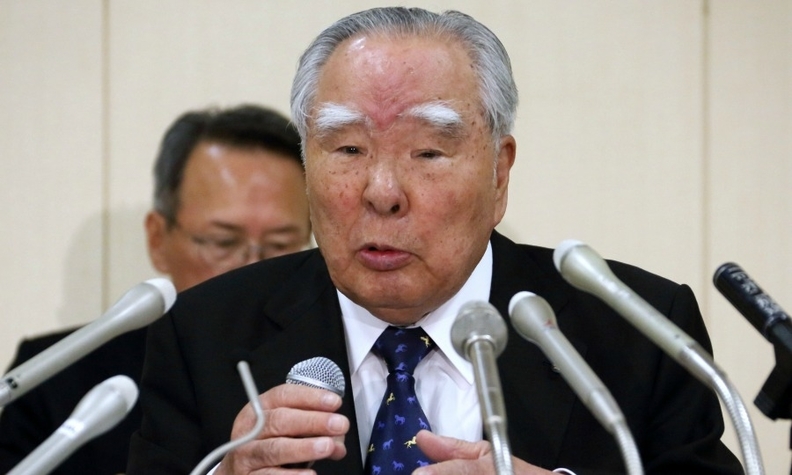 TOKYO (Bloomberg) -- Suzuki Motor Corp.'s investors are becoming increasingly concerned at the lack of clarity over who will succeed the carmaker's 84-year-old Chairman and President, Osamu Suzuki, who has spent almost three decades as head of the carmaker. On Friday, Suzuki's term was extended by one year at the annual general meeting in Hamamatsu, southwest of Tokyo, despite his age. "It's a big risk having a 84-year-old at the helm and there's a widespread sense of uncertainty," said Kazuyuki Terao, Tokyo-based chief investment officer at Allianz Global Investors Japan Co. "We're most concerned that if Osamu leaves suddenly given his age, the market will react negatively without knowing what comes next." While Suzuki earned a record profit last year, its revenue is dwarfed by automakers like Toyota Motor Corp., undermining its ability to keep up with spending on research and development. Investors such as Mizuho Asset Management are also concerned about the carmaker's strategic direction after Osamu Suzuki leaves. While he hasn't designated a successor, Osamu Suzuki promoted four of his lieutenants in 2011 to the level of executive vice presidents, from which a president may eventually be chosen. They include his son, Toshihiro Suzuki, 55, who heads the company's overseas business. The other three EVPs are Yasuhito Harayama, 58, who used to work for Japan's economy and trade ministry, and company veterans Minoru Tamura, 66, and Osamu Honda, 64. "It's not transparent," said Takashi Aoki, a Tokyo-based fund manager at Mizuho Asset. "We don't know what to expect. That's not good for investors." Both Allianz and Mizuho Asset owned Suzuki shares, according to data compiled by Bloomberg. Ei Mochizuki, a Suzuki spokesman in Tokyo, declined to comment on the matter. Osamu Suzuki's son-in-law Hirotaka Ono, whom he groomed to take over Suzuki Motor, died in 2007 at the age of 52 after battling pancreatic cancer. In his memoir, "I'm a small-business boss," Osamu Suzuki wrote that his plan "fell apart" with Ono's passing. "Nothing is more difficult than picking a successor," he said in the memoir. "Although president is not a position that can be shared by many, I have to say I made a mistake by locking in the person too early. I should have prepared two to three candidates, because you don't know what will happen to them no matter how young they are." The new Suzuki president would have to safeguard the company's dominance in India, its biggest market, where Nissan Motor Corp. and Honda Motor Co. are wooing customers with wider, lower-priced selections. The new chief would also have to see through its dispute with shareholder Volkswagen Group -- if Osamu Suzuki isn't able to do it himself while still president -- and find a new alliance partner. "We understand the need for the discussion for succession," Toshihiro Suzuki said in an interview in August. "For now, our priority is to put an end to the VW arbitration." The issue of succession wasn't discussed at the two-hour annual general meeting on Friday, which was attended by 569 stock holders. A former bank employee, Osamu Suzuki got his start in the automotive business through his arranged marriage to Shoko Suzuki, the granddaughter of Michio Suzuki, who founded Suzuki Motor's predecessor company. He then took his wife's surname, as is the Japanese custom when there are no male heirs to a family business. In a career spanning five decades, he led Suzuki Motor's overseas expansion by leveraging the carmaker's expertise in small cars to build a dominant market share in India during his first of two term as president from 1978 to 2000. He also steered the company into alliances with two of the world's biggest automakers, VW and General Motors Co., that ultimately failed. In 1981, GM, then the world's biggest carmaker, agreed to buy a stake in Suzuki as the Japanese company sought to expand in North America and Europe. GM would later hold as much as 20 percent of Suzuki Motor after doubling its stake in 2001. Reeling from five straight quarterly losses, the U.S. carmaker began selling its Suzuki Motor shares for cash in 2006 and completed the divestment in 2008, before filing for bankruptcy. After the GM alliance was dissolved, Suzuki Motor agreed to a tie-up with Germany's Volkswagen, which bought a 19.9 percent stake in the Japanese company in 2010. The VW alliance descended into acrimony after the German carmaker described Suzuki Motor as an "associate" in an annual report, and as the Japanese carmaker accused VW of disparaging its honor by alleging Suzuki Motor had violated their partnership agreement by buying engines from Italy's Fiat Group. The two partners have been in international arbitration since November 2011 to settle Suzuki's demand that VW sell back its stake, which VW has turned down. When Osamu Suzuki took over from Hiroshi Tsuda in 2008 for his second stint as president -- in addition to his role as chairman -- Suzuki Motor was facing its first profit decline in eight years as a global recession and tighter lending dented car demand. He cut costs by shifting some production out of Japan to Thailand and pulled out of the U.S. in 2012. In India and Japan, the company's two biggest markets, he boosted Suzuki's sales after revamping the Wagon R and Alto small cars. Last year, the company made a record profit of 107.5 billion yen. Suzuki's shares have gained 13 percent this year, outperforming the 3.5 percent decline in the benchmark Topix Index. "I think he has done a terrific job with the company," said Edwin Merner, president of Atlantis Investment Research Corp., which doesn't own Suzuki shares. "But it's time for somebody else to take it over."